American Tree Company, locally owned and operated in Bear, Delaware provides area homes and businesses with professional tree services. 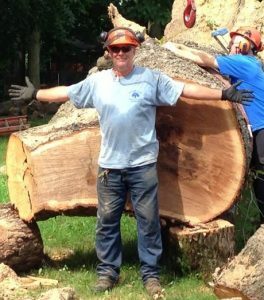 We offer, complete tree care including Tree & Bush Removal – Trimming – Stump Removal – Stump Grinding Free Estimates – Senior & Veteran Friendly Evening & Weekend Appointments Emergency Service. We give the utmost respect to all of customers, especially our seniors, military families and veterans! American Tree Company has served it’s business and residential customers reliably for over 10 years in the New Castle County area. We offer EMERGENCY SERVICE. Calls involving fallen trees or debris are given very prompt attention. We gladly accept insurance work. Tree removal is just one of our specialties. With our new, state of the art equipment, we can completely remove trees as well as clear lots and hillsides. At American Tree Company we believe that our trees, shrubs and woods enhance our properties and should be taken care of on a regular basis. Contacting us for a free consultation service is the first step of taking care of your outdoor needs. American Tree Company has a sterling reputation and guarantees 100% customer satisfaction! As a professional company, we require all of our employees to be CPR certified and First Aid Trained. You can be certain that we always follow OSHA standards for safety. Family owned; affordable, reliable, nice workers. Have used them twice. We had leyland cypress trimmed and one cut down. I couldnt believe how quickly they did the work. And it was really HOT that day. Pat came out the day before for the estimate and said he could do work next day. Prices were great and he and his workers were very professional . I will definitely use them again. During a recent storm, one of our trees in the backyard was uprooted. Unfortunately, many residents in the county had similar problems and the insurance company took 3 days to get back with me. Finally an adjuster suggested American Tree and gave me Pat's phone number. When I called, I was surprised that Pat answered and after a short discussion said he would come out the following day, rain or shine. As promised, Pat called on Saturday said he was coming over in 30 minutes. He showed up as promised and began to appraise my situation. While talking with Pat he mentioned that he had received several hundred calls in the past few days, but would be able to speak with the adjuster and take care of the removal within a few days. This was important because the tree was leaning against two other trees which could also be displaced if not attended to soon. On Monday, Pat called and said he'd be over on Wednesday. He arrived with his trucks and equipment and was able to remove the tree and clean up the yard within 30 minutes. Pat's efficiency and concern about getting the problem solved before it caused additional complications was astonishing, especially given the workload they were facing. I couldn't have been more pleased with the results and felt fortunate that Pat and American Tree had been available to provide that much needed service. Had them remove a stump for me. Great service, they even helped me move my hot tub with their tractor. I would definitely recommend them.